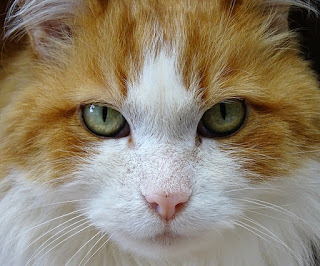 Thomasina's Purrls Of Wisdom About Cats: Fighting Fur? Why Does Your Cats' Fur Stick To Everything? Fighting Fur? Why Does Your Cats' Fur Stick To Everything? Does your cats' fur stick to everything? My cats' fur sticks to everything, Thomasina. It even clings to the legs of my tables! Why does it do that? Good question! We have the same problem here. Our cats' fur sticks to everything, too. We make such a mess! The simple explanation for why your cats' fur sticks to everything is that cat hair has a positive magnetic charge. I have no idea what that is. But I do know that as we move around the house, we come into contact with things that have a negative magnetic charge (I don't know what that is either!). Like any other magnet, when one meets the other, they stick together. Dog hair clings to things, too. But cat hair is finer than dog hair, so it can slip into tiny spaces between threads of fabric more easily than dog hair does. Then, it just stays there. Most cats have more hair per square inch of skin than dogs do, too. Here's another reason why your cats' fur sticks to everything. Hair is made up of dead cells stacked on top of each other. We just found this out! The outside layer is made up of flat, saucer-like cells that are attached to each other side by side. Those spaces between the cells help cat hair hang on to everything, even the legs of your tables. Here are some things to do when your cats' fur sticks to everything. Give your cats wet food. An all-wet-food diet is best. They'll shed less if their skin is in top shape and they're well hydrated. Brush your cats often. A greyhound comb is great for removing loose hair. So is the Zoom Groom, and a flea comb works, too. Or just pet your cats with a grooming glove or your bare hand. The cats are our house aren't crazy about grooming gloves, but we love the feeling of our human's hand on our backs. Kitty wipes can also reduce shedding. Invest in a really good vacuum cleaner with a pet tool. Use the pet tool to go over furniture and even blinds and curtains. Use an electrostatic or microfiber dry mop for your bare floors. Dust with an electrostatic or microfiber cloth, too. You can remove cat hair from clothing and furniture with a damp or dry sponge or a rubber glove. Run clothes through the dryer before washing them to get some of the cat hair off. If you put the clothes in the washer first, the wet fur will cling to them and will get cat hair all over your washer. Then it will attach itself to other clothes. I hope this answers your question, Sooo Tired. Oops! a big clump of cat hair just landed on my human typist's keyboard. We need to pick it up before it finds its way to her black sweater!